Broad-tailed Hummingbird: Breeds in the mountains from eastern California and northern Wyoming through the Great Basin and Rocky Mountain states to southern Arizona and western Texas. Spends winters in Mexico. Preferred habitats include mountain meadows, pinyon-juniper woodlands, dry ponderosa pines, fir or mixed forests, and canyon vegetation. 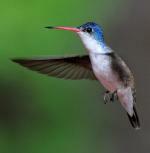 The Broad-tailed Hummingbird has a large range, estimated globally at 700,000 square kilometers. It is native to North America and Guatemala and prefers subtropical or tropical forests, shrublands, or grasslands as well as former forests. The population is estimated at 3,800,000 individuals and does not appear to be declining at a rate that would necessitate inclusion on the IUCN Red List. Because of this, the Broad-tailed Hummingbird has an evaluation status of Least Concern. Accounts of this species mention that it nests in the same tree or bush year after year, a phenomenon known as philopatry-faithfulness to the previous home area. It will return to the same branch and even build a new nest atop the old one. One female holds the North American age record for hummingbirds, at twelve years old. The Broad-tailed Hummingbird enters torpor, a slowed metabolic state, on cold nights. 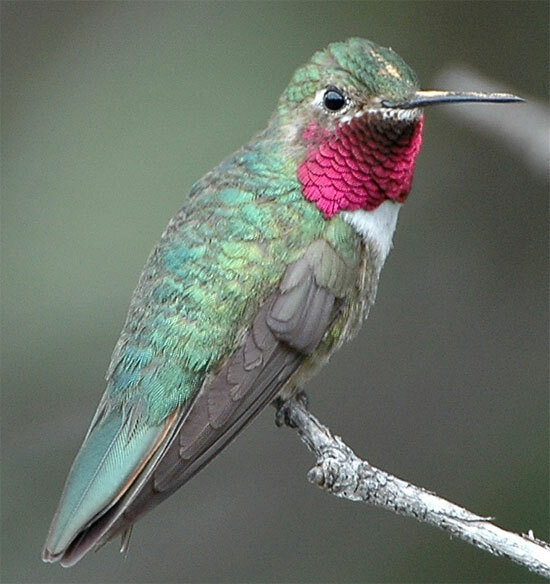 It maintains a body temperature of about 54° when ambient temperatures fall below 44° F. A group of hummingbirds has many collective nouns, including a “bouquet", "glittering", "hover", "shimmer", and "tune” of hummingbirds.